The MGB Mark 3 sports car was introduced in 1972 as a result of additional changes made to the car since the Mark 2 version ended in 1971. As a result of additional US regulations relating to safety, the company found that the headlights on the MGB were too low. The obvious solution was to redesign the front of the car. However, for reasons of cost, the car's suspension was simply raised by an inch and a half. This change, in conjunction with the addition of black rubber bumpers strengthened with steel, resulted in a deterioration in the car's handling characteristics, producing excessive roll on hard cornering due to the increased height and weight. To make matter worse, the front anti roll bar was removed in order to reduce costs. Instead, it was offered as an optional extra. These changes affecting the handling of this sports car received a negative response from the market from which the car, and in some ways, the company never fully recovered. The aforementioned handling problems were addressed that year by the use of a thicker anti roll bar. Cars fro the home market were now fitted with catalytic converters which had an adverse effect on their bhp. In 1968, BMC (the British Motor Corporation) was taken over by Leyland Motors to form British Leyland who tended to use, as many would agree, the least expensive and imaginative ways to satisfy US emission regulations. As a result, the MGB steadily lost bhp and became less attractive. 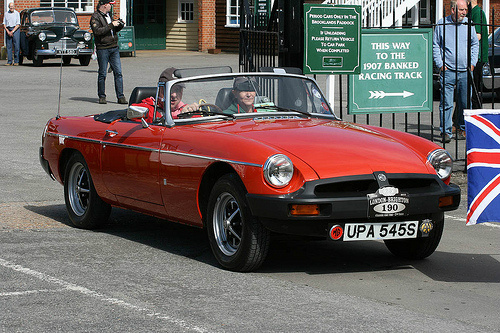 As an illustration, by 1975, MGB's exported to the US only generated 62 bhp, compared with the 95 bhp at launch. Once the decision had been taken to end production of the MGB in 1980, a final batch of cars was designated the MGB LE, a limited edition of 420 convertibles and 580 GT's. These used various components that were still available in the factory, such as alloy or wire wheels, and an airdam, in order to finally stimulate sales which were now on a downward spiral. The convertibles were painted metallic beige, while the GT's were coloured pewter. The end of the MGB was probably influenced by the fact that, once British Leyland was in the driving seat, they tended to place a greater emphasis on the Triumph product range than that of MG.
Consequently, the MGB went into the 1970's being able to make only minor changes despite the tough new US emission and safety regulations. 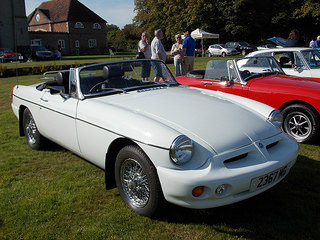 Subsequent to its launch, there were two projects put forward to consider the eventual replacement of the MGB even though, at the time, many felt that the original design was ageless. The first project, conceived in 1966, involved body styling by Pininfarina in which hydrolastic suspension was to be used, since it had been successfully tested on the BMC Mini. However, this idea was rejected. A second project, somewhat futuristic in concept, was considered in the early 1970's. This involved a mid engined car, using a 1750 cc unit from the Maxi saloon, incorporated within a modified MGB GT body. This too was rejected since it was felt it would use too few components from other BL cars, and would therefore be too expensive to produce. It is interesting to note that, even though the MGB was built for 18 years, the original body styling remained unchanged. A 1972-80 MGB Mk3 in average condition would fetch between £3,000/$5,000 to £6,000/$10,000, whilst a really excellent example would command up to £11,000/$18,000.